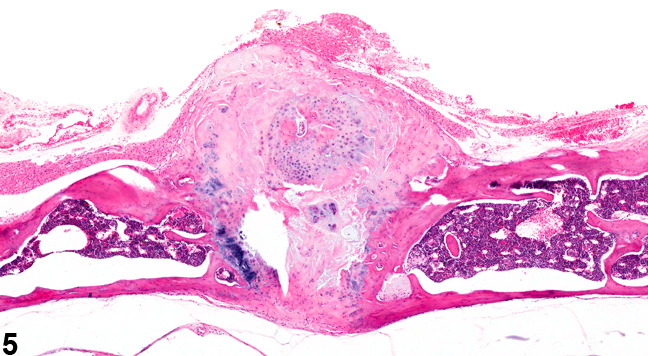 Bone, Intervertebral disc - Degeneration in a male B6C3F1/N mouse from a chronic study. There is extrusion/prolapse of the intervertebral disc dorsally, causing compression of the spinal cord. 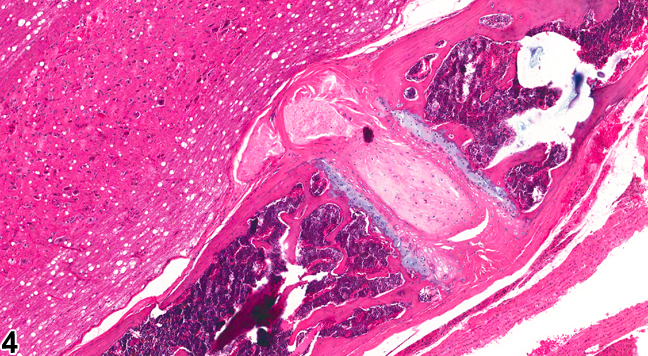 Bone, Intervertebral disc - Degeneration in a male B6C3F1/N mouse from a chronic study (higher magnification of Figure 1). There is degeneration of the nucleus pulposus and extrusion/prolapse of disc material dorsally, causing compression of the spinal cord. 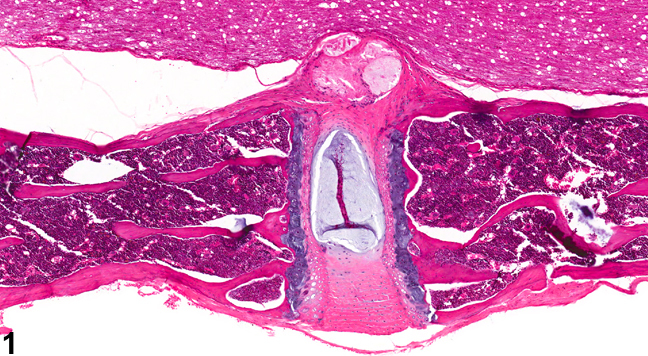 Bone, Intervertebral disc - Degeneration in a male B6C3F1/N mouse from a chronic study. There is dorsal extrusion of the intervertebral disc, with compression of the overlying spinal cord. 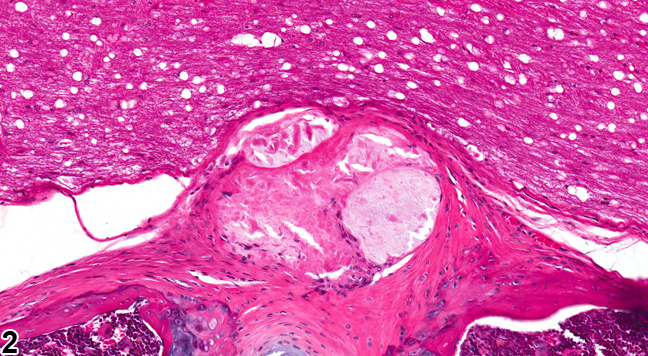 Bone, Intervertebral disc - Degeneration in a male B6C3F1/N mouse from a chronic study (higher magnification of Figure 3). There is dorsal extrusion of the intervertebral disc, with compression of the overlying spinal cord. 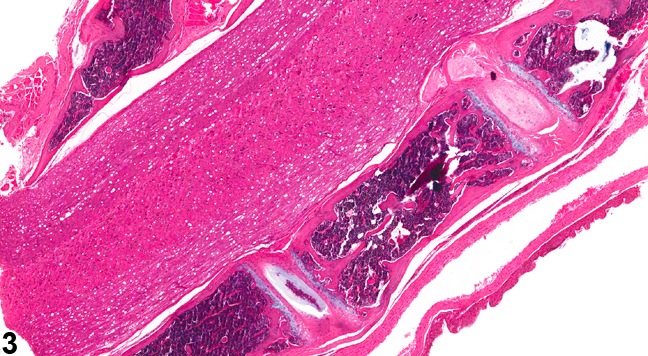 Bone, Intervertebral disc - Degeneration in a male B6C3F1/N mouse from a chronic study. In this section of vertebral column, there is degeneration of the nucleus pulposus and extrusion/prolapse of disc material. The intervertebral disc functions to transmit mechanical loads arising from body weight and movement. The disc is composed of an outer ring of fibrous connective tissue (annulus) and a gelatinous core (nucleus pulposus) composed of collagen and elastin fibers embedded in a chondromucinous matrix with a high water and proteoglycan content. Intervertebral disc disease is characterized by chondromucinous degeneration of the nucleus pulposus. In general, this is an age-related lesion that occurs as the result of loss of water and proteoglycans in the nucleus pulposus. The nucleus pulposa undergoes variable degrees of fibrocartilaginous metaplasia and becomes friable, fragmented, or clefted. There is irregularity and thinning of the annulus and eventual dorsal herniation into the vertebral canal ( Figure 1 , Figure 2 , Figure 3 , Figure 4 , and Figure 5 ). Intervertebral disc disease is typically an age-related change in rodents and may be accompanied by variable changes related to bony remodeling, alterations to the cartilaginous endplates, or joint disease (spondylosis, arthrosis), depending on severity and chronicity. "Bone, Intervertebral disc - Degeneration" should be diagnosed and given a severity grade whenever observed. Associated changes in the bone or cartilage do not need to be diagnosed separately unless warranted by their severity; they can be described in the narrative. Degeneration of the spinal cord should be diagnosed separately if warranted by the severity. Adam MA, Roughley PJ. 2006. What is intervertebral disc degeneration, and what causes it? Spine 31:2151-2151. Silberberg R, Aufdermaur M, Adler JH. 1979. Degeneration of the intervertebral disks and spondylosis in aging sand rats. Arch Pathol Lab Med 103:231-235. Urban JPG, Roberts S. 2003. Review: Degeneration of the intervertebral disc. Arthritis Res Ther 5:120-130.